Waffle House has held a firm place in customer's hearts for decades. What makes a house a home? In this case, it's a hashtag. Since at least 2010, people on Twitter have been tagging their Waffle House adventures with #wafflehome, but it was in January that the concept truly picked up steam. 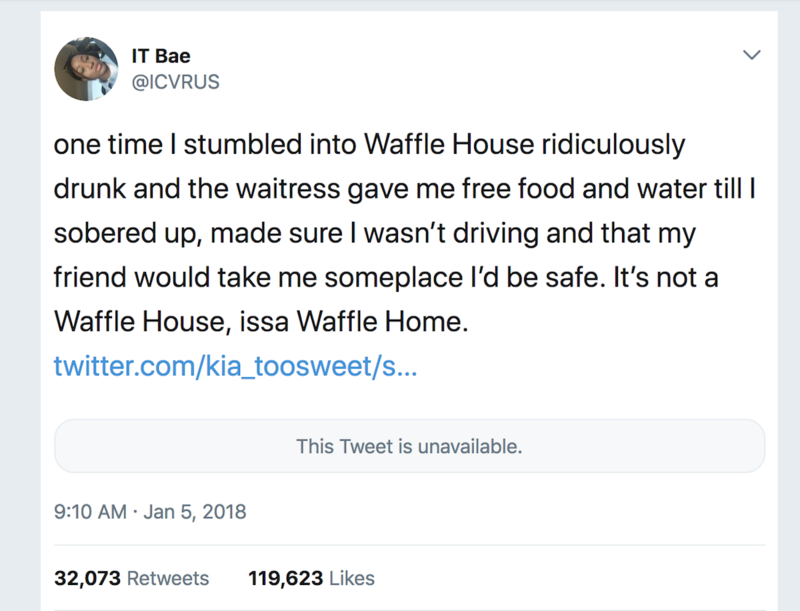 The tweet that started it off was retweeted more than 32,000 times and received almost 120,000 likes, with many responses adding the #wafflehome tag that was absent in the original tweet. From there, the hashtag grew to include everything from stories of servers providing trays to be used as impromptu sleds during ice storms, to tales of dogs being invited in from the elements. What has been consistent among all the tweets is the effusive praise that Waffle House patrons have heaped upon the chain, which is concentrated in the southeastern part of the United States. That commitment to customers and creating relationships is integral to the physical design of Waffle House buildings: the open kitchen, which places the grill in the center of the restaurant, is intended to make guests feel as though they’re eating in someone’s house, Warner says. And as the kitchen is often where the majority of socializing takes place, when people visit a Waffle House, they truly do feel at home. That means trying to engage with the idea of #wafflehome in an authentic way, rather than necessarily leveraging it for commercial gain. This laissez-faire approach to trending topics is one that other brands might learn to harness; more than one has seen their attempts at keeping up with “the kids” fall flat. But for Waffle House, it’s part of their philosophy. “In the case of #wafflehome, we did participate a little in the social conversation with a couple of posts. However, we didn’t want to dominate it or take it over,” Warren says. And as for the customers? If Twitter is anything to go by, it seems like they have found a place where they can go home again.